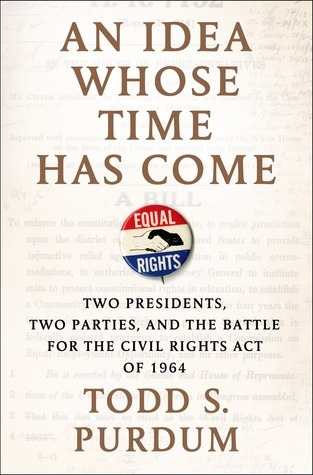 “An Idea Whose Time Has Come” relates the convoluted steps leading to the passage of the Civil Rights Act of 1964, starting with the championship and oversight of the bill’s design by the executive branch (namely the Kennedy brothers) and its subsequent evolution through passage in the House and Senate. This political development, rather ‘dry’ in itself, is of course set amid the turbulent social upheavals of the era and that event that both helped propel this ‘project’ forward and led to new difficulties in its realization, namely the Kennedy assassination and the new leadership of Southerner Johnson. Purdum does a fine job relating the details of the Act’s development and ultimate passage, and after reading about the many failed party compromises of recent years it is interesting to read about one instance where something substantial was achieved. Unlike recent issues, however, this Act had split support and opposition from wings of both Republican and Democratic parties, and thankfully the extreme wings of each party that fought against this Act were each in the minority, unlike today. The majority of focus in the book is on the executive branch, pervading each step leading to the final passage, and as such the people involved in the legislative branch on either side get relatively less attention. Already less familiar with these people, greater biographical detail on these players and their pasts would have been nice. While the book does an excellent and fair job of relating the history involved, it spends very little space on any type of analysis. Largely this seems to avoid any kind of bias or opinion, as opposed to just stating the facts or reporting the recorded opinions of those involved in the process at the time. This is not a fault, but if you are looking for something beyond a simple history of passage this may not be of interest. But if you are largely unfamiliar with the details of this period of history, Purdum’s work serves as an excellent primer and education, offering glimpses not just into politics, but the social situation of the United States in the early 60’s and the racial injustices so many citizens endured and fought to overcome.